A beautiful, ruffly pink beauty, has been born. 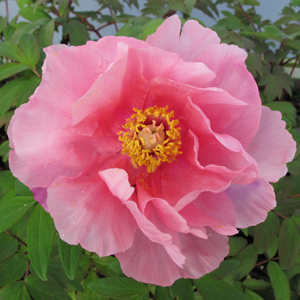 Paeonia ‘Hanakisoi’ features enormous apricot-pink semi double blooms in late spring. The beautiful flowers are fragrant and elegantly ruffled. ‘Hanakisoi‘ is wonderful as a cut flower! 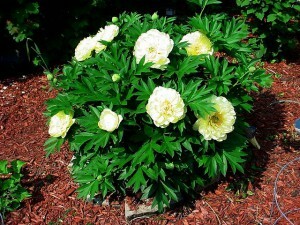 Tree Peonies differ from garden peonies in that they have a woody stem like a shrub. The woody branches do not die back to the ground in the winter and should not be trimmed back.